And today was no exception. But I packed a mac and headed for Cookham, that lovely village nestling on the Thames. 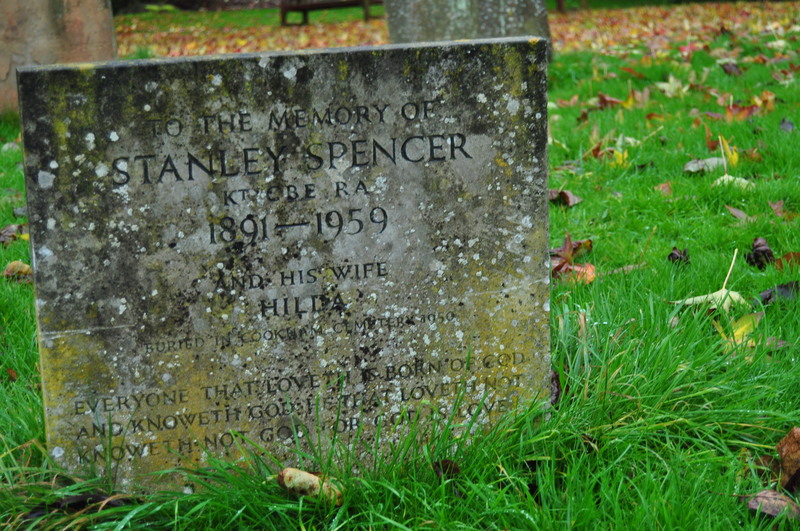 I had half an idea about finding more about its most famous artist, Stanley Spencer. I knew nothing about him. It was a fine upstanding name, though. The light had a diffuse impressionism about it. It rendered the village full of a strange, misty energy I could not quite define. I pottered through the raindrops, along the quaintest of high streets, to the little church and its pretty graveyard. And there by the path: there was Stanley’s grave, his stone green-lichened, announcing that he shared this space with his wife Hilda. Inside, the church was all ecclesiastical gloom and complete solitude. Not a soul was there, and my footsteps rasped as I trod the old tiles looking at the signs men have left. There it was in the shadows of a thousand-year old church, half way along: a large painting entitled ‘The Last Supper.” And it was a copy of one by Stan. Ethereal, it is. Haunting. The faces look so familiar, each apostle with his legs stretched out and relaxed underneath the table, and Judas laughing behind his hand. Maybe I should learn more about this man, I thought. Stanley of the gravestone, and the ethereal friends’ supper. Stanley was born in Cookham, and raised in Cookham, and he loved Cookham. At the Slade School of Art his friends jokingly called him Cookham. Even in his student days- 1908-1912 – he insisted on getting the train home every evening to be in what he called ‘a village in Heaven’. 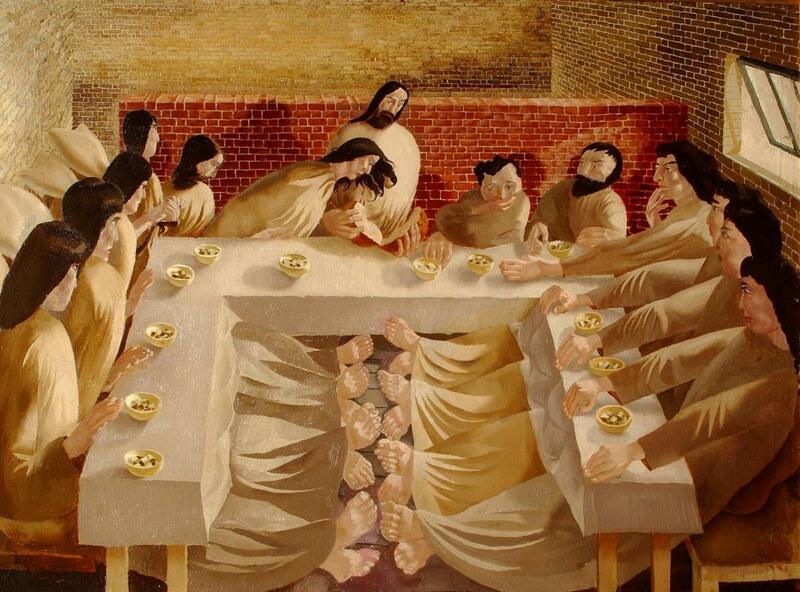 And his art – each piece breathtakingly beautiful- is full of Cookham people and topography, painted “as if,” a Times critic ventured, “a PreRaphaelite had shaken hands with a Cubist.” The Last Supper is quite possibly peopled with Cookham villagers. If ever there was a creature of place, Stan was he. He was compelled to leave during the First World War, first with the Royal Army Medical Corps and then on the front line in Macedonia. When he returned home the painting he had been working on was waiting for him on his bed. But he was not stolid. Rather, he seems to me to have been a mystic. In Cookham, he saw miracles everywhere. This joy; this unfettered unEnglish ability to see the extraordinary in the ordinary; I see it rarely. Back at home, I googled painting after painting. The language they used was so familiar and yet so transforming. The faces were English, the light English, the situations fantastical. And suddenly I saw it: the graveyard in which I had been squelching that afternoon. But transformed utterly. For this was The Resurrection, Cookham; and in it, those who have been sleeping are waking, as you would on a lazy Saturday morning. Many wear white, or nothing at all, and lean on their stones, awakening to the realisation that it is time for an eternity of life. And I was there. This afternoon. In the rain. Something of that man’s infectious joy had crept into my spirit and I was glad, in a thoroughly timeless sense. Stan’s latter days were spent with two different wives; he was a common figure pushing his black pram about the Cookham lanes, carrying brushes, paints and canvas, his pyjamas poking out from the bottoms of his trousers. He died of cancer in 1959; a man who had seen and understood life through the prism of a small Berkshire village. And he left his understanding behind him for me to stumble upon, one rainy November afternoon, in Cookham. Posted in Places to visitTagged art, artists, berkshire, Britain, Cookham, england, Stanley Spencer, travelBookmark the permalink. I have heard of him but I thought he was a poet – just as I typed that, I realised why: in the first year of my Literature degree, we had a Humanities course and we looked at Spencer’s war paintings. Incredible stuff. The feet sticking out in this painting intrigue me. Next time you go Stanley hunting do visit the Sandham Memorial Chapel (NT) it is magnificent. Stanley was highly influenced by Giotto’s Arena Chapel, Padua. In the year of his death he received a knighthood. He carried his old shopping bag with him to Buckingham Palace, inside was a small painting that he had done for the Queen Mother. A vase of two roses, wrapped up in brown paper and string. Wearing a newly cleaned suit he handed the picture to an Equerry who declined to give it to the QM. Stanley brought it back home with him, and popping into a local cafe he handed the painting to the owners. Years later they sold the painting for many thousands of pounds. There is still a restaurant in Cookham called the Two Roses, and I believe that there is a copy of the original painting on the wall. I am amazed the equerry refused the painting. It’s tant amount to dismissing Fred Astaire as someone who can dance a little. Thank you for the Sandown tip, Rosemary: the chapel is closed until Christmas, but I shall potter along just as soon as it opens afterwards. Wonderful painter and true English eccentric. I’d forgotten about Spencer – timely reminder to look at some of his pictures. Nice one, Kate. Thanks, Roger. It was rather wonderful to marry up the churchyard with that picture of his. I want one of those huge picture books full of his paintings to pore over now. Wonderful batch of paintings and what a unique man, not often one embraces their hometown so thoroughly; we often find many more ways to escape it. It was very unusual, wasn’t it, Lou? I loved those words of his. Wonderful to observe sacredness in unexpected corners of one’s home village. I love the way that you’ve presented Stanley to us Kate. I leave wanting to know him. I’m not familiar with his art but agree that the piece is fantastic. The feet! How remarkable is the magic of the feet in that painting. I know. I find all his Cookham paintings as wonderful I love the walls behind, too, and that window: so 20th century, so red brick and solid. The painting leaves myriad questions floating in the air. I find I’m fixated — and not in a pleasant way — on all the bare feet in the middle of the Last Supper. Off-putting, such focus on bare feet at a meal. Silly me, I suppose. Nope, PT, each to his own. He had a strange way of combining the earthy with the ethereal. Ackroyd says, “to Spencer, the light of the Thames is the halo of eternity.” That does confirm that he very much loved Cookham. I can relate to your Stanely. What a unique perspective . . . with all those ape-sized feet at the center of attention. All reposed in identical postures. Thanks for the intro, Kate. How special it must be to have an ability like Stan’s! The Last Supper is superb.